Terracotta candle holders on painted coasters are the perfect addition to a rustic themed wedding. Adapt the design and colours to suit your table décor. Mix some paint for the wooden coasters, using white as the main colour with a small amount of any other colour to create the right shade. Leave to dry then lightly brush white paint over the top using a dry brush. When the paint is dry, rub the sides of the coasters to create a worn effect. The pots can be decorated in different ways. To add a hessian strip, cut a piece of double sided tape, stick it around the top of the pot, peel off the backing then stick a 22cm x 2cm piece of hessian over the top. For making frayed edges, cut a wider hessian strip (4cm) then pull away some of the strands before sticking it onto the pot. Glue buttons or small felt hearts onto the pots. 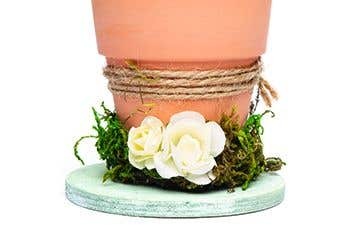 Jute twine can be wrapped around the pot, with double-sided tape underneath to stop it slipping. 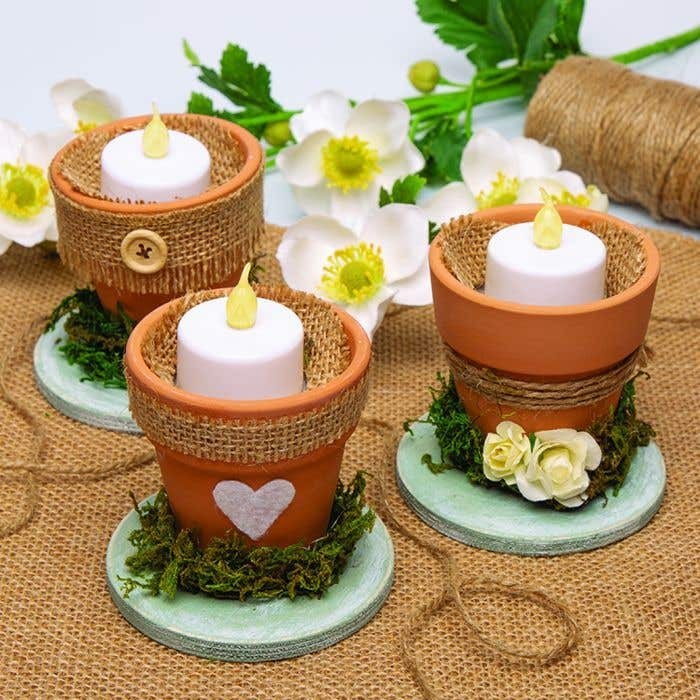 For holding an LED candle inside a pot, cut a 5.5 cm diameter circle from thick card, push the card inside a pot, resting about 2cm from the top. Cut a 7cm circle from hessian, fold it in half and cut a 3cm circular hole in the middle. 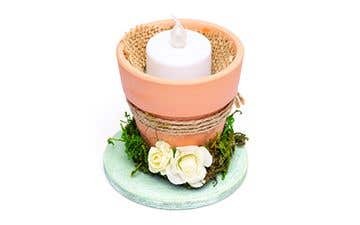 Fray the edges of the hessian, push a candle through the middle then place it onto the card inside the pot. Squeeze glue around the pot bases then press dried moss over the top. Glue paper flowers to decorate. Place the pots onto the painted coaster bases. 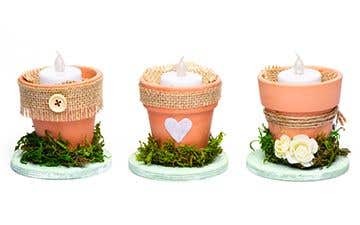 Candles can be arranged individually on coasters or small wooden slices or grouped together on a larger slice or a piece of slate.